One of the things I personally like most about Virtual Reality and 360° videos are the places they can take you to, the things that you can see like you have never seen it before. In this short video we are taken under the sea straight into Shark territory. The narrator gives some information about the Great White Sharks, and you can look around the scene in 360° video. There is a giant Great White Shark swimming up to the camera and if you are not a shark fan it could be terrifying. The Great White Shark, one of the most infamous and mysterious predators on the planet. Watch our 360 3D Virtual Reality adventure, created in CGI, as you see Great Whites closer than you’ve ever been able to see them before. The great white shark is mainly known for its size, with mature individuals growing up to 6.4 m (21 ft) in length (although reports have been published of great white sharks measuring over 8 m (26 ft)) and 3,324 kg (7,328 lb) in weight. This shark reaches its maturity around 15 years of age and was previously believed to have a life span of over 30 years. The true lifespan of great white sharks is far longer, now estimated to be as long as 70 years or more, making it one of the longest lived cartilaginous fish currently known. Male great white sharks reach sexual maturity at 26 years of age, females at 33 Great white sharks can accelerate to over 56 km/h (35 mph). 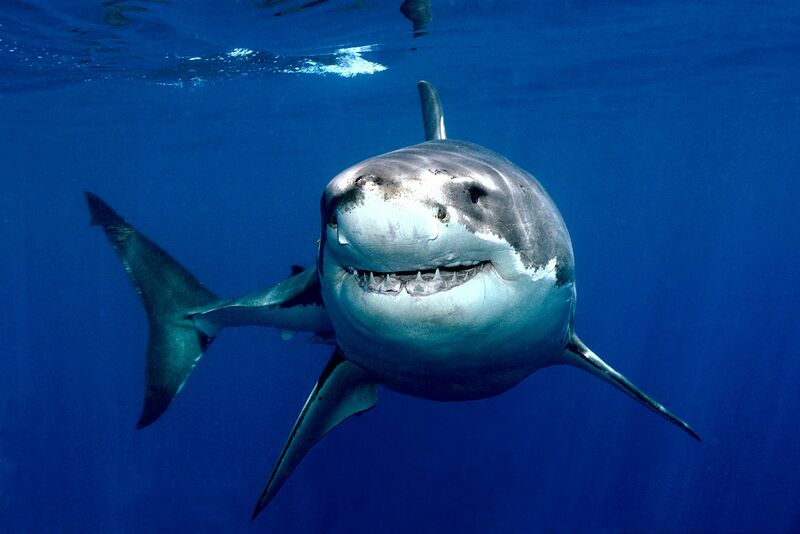 The great white shark has no natural predators other than the killer whale. The great white shark is arguably the world’s largest known extant macropredatory fish, and is one of the primary predators of marine mammals. It is also known to prey upon a variety of other marine animals, including fish and seabirds. It is the only known surviving species of its genus Carcharodon, and is ranked first in having the most recorded attacks on humans. For more information on the Great White Shark you can visit the Wikipedia page on Great White Sharks. One of the best ways for anyone to learn is to experience something for real. In some cases it is impossible for us to experience something like the great white shark for ourselves. We likely have to pay a small fortune for the experience to go diving with the great white sharks. Now although it is not the same as really diving with sharks, people can now get the experience by simply popping on a Virtual Reality headset and bob is your uncle. In this short video the concept of learning by Virtual Reality is clearly being illustrated. When you put on a Virtual Reality headset and watching the video, your mind is tricked into believing that you are actually there. It is very realistic and for young minds an experience that will both impress and educate at the same time. Virtual Reality as an educational tool have so much possibilities and it would be interested to see how school kids, students and hungry minds of the future will learn with virtual reality applications like the 360° great shark video of the future. The video was created by curiscope – Imagine where we are going to go next with Virtual Reality.